I spent the weekend raging. Beginning on Friday night, glued to the links I’d followed from Facebook about the Charlie Hebdo murders, I raged against the simplicity of media analysis, raged against hatred, and then, at midnight, sitting up in bed, I raged against my husband for not “getting” politics and race in precisely the same way I do. He slept in another room. So, on Saturday, I raged against myself. For being so full of rage, of course. And for not doing my community workday job quite right, for stumbling through communication with both friends or family, for not being as calm, as full of a sense of bright promise, as I had been earlier in the week. I raged at the futile inconstancy of things. And then on Sunday, I raged against my four-year-old son, who was yelling at me about everything from Legos to frozen waffles to pants that had no zipper pockets, and who bit me at bath time at the end of the day. And then this morning, I went for a walk. It has been a long time since I’ve walked alone on our community land. I forged quickly up the hill, my thoughts churning, but determined that this walk would empty me of rage. I’m not paying attention, I kept telling myself, forcing myself to slow down, look around. If only I pay attention, I’ll feel better. I’m not lingering in the places that I love. If only I spend time in beauty, I’ll feel better. But my rushed body passed quickly over my favorite sunny stretch of vivid green road cut through madrone forest at the back of our property. Just as the green was fading into scrabbled rock and shade, I turned back to look. I almost returned. I wanted to sink into the ground, smell the muck underneath the wet emerald softness. But even as I stopped and turned into it I knew it would be impossible to catch. I had already crossed over. I was on my way. 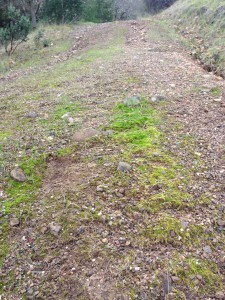 And then there was the dreaded steep and rocky hill. When my husband and I walk this stretch, we usually end up planning ways to circumvent its necessity by plotting a new trail through the forest. But halfway up, today, I was there, nowhere else. Not wanting to turn back, not wanting to circumvent, not wanting to hurry forward. There was a worn white oak branch at the side of the road, forked like the bleached white antler that I have at home. There were the melting shades of red and orange earth. 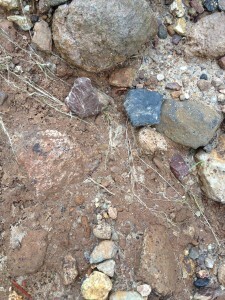 There was a red rock striated with lines of feathery quartz, strewn in the midst of drying feathery grass. The rock was like a creature who wanted camouflage. It made me wonder. Right there, and nowhere else. And then, of course, there was no precise line when the arid tumbly rock ended and the mossy emerald growth began again. I noticed that. That lack of precision in the crossing back over into what is conventionally called pleasure. And then I sat to write, and noticed more things. I noticed how I always want my back against something. Even the massed thicket of coyote brush, with small birds rustling, feels better than the openness between medium oaks and weeping madrones. And then I ate a snack, and saw my regret at eating peanut butter and chocolate in a foil wrapper that glared against the earthen colors around me. I want everything to be soft and edgeless, everything to be “natural.” But I’m stuck with the world as it is. I’m stuck with me. My husband is no longer sleeping in the other room, and once again we have walked through anger, in love. Yesterday, when I cried in front of my son, defeated by his loud and voluble longing, he wrapped his little arms around me and kissed me. “I love you,” he whispered. And then we both put our pajamas back on, and agreed to restart the day. He still bit me, and I still don’t know what to do with his intense relationship with Legos, but we crossed over together, into today. Is today what is conventionally called pleasure? I’m not sure, but I know I’m on my way. January 12, 2015 in Earth, motherhood, nature. A line you wrote stood out for me “I raged against my husband for not “getting” politics and race in precisely the same way I do.” Not sure exactly why, but it did. Maybe it had something to do with “politics” or “race”. I don’t think about race a lot, or actually at all, maybe its because I am Canadian, or maybe it’s because I don’t feel a need to. I do notice it that bothers me when everyone, the media in particular, keepings talking about race. It feels like a smoke screen covering something deeper, something truer and more unpleasant and pressing. Bad behaviour is bad behaviour, if we drop ideas of race and politics, we left are with plain reality. I would rather talk about and deal with that. When we are lost in our thoughts and beliefs and we go for a walk in nature, sometimes a warm sparkle of light on a leaf will wake us up. Thats what the rest of your piece reminded me of. Thank you so much for reading. Guess what I noticed? I noticed that it bothers me that it bothers you that people keep talking about race! I agree that there is something deep and uncomfortable underneath, and I know that “race” is not real, and I think there is a way to talk about racism that honors that depth and discomfort, and unreality. I wrote in another post: “I think these things need to be said out loud: That we all suffer equally because we think things are real. And that things are real.” I do not always feel up to the challenge of holding both/and, but in the face of so much suffering as a result of false distinctions, I think it is worth trying. Your post also made me think of this spontaneous, incredibly powerful video made by the rapper Prince Ea, called “What No One Wants to Say About Ferguson.” Have you seen it? I would love to hear your response. “What I thought was an end turned out to be a middle. Good writing does cause a bit of a bother. Well done. I can’t get Tony Hoaglands poem out of my head – its like a koan opening and opening and opening. Its a warm sparkle of light on a leaf – nothing left unsaid. Feels like we just shared a glass of red wine, a rich and earthy red wine. Makes me what to ask if there is something else that race means to you. So glad all this just happened, I’m off to give a Dharma talk shortly, I can’t wait to hear what comes up in my talk. Oh, that glass of wine made my night. I like the fire that keeps coming up in you and your family. It seems like something true at the center of things. I also like the way you identify with those whom no one identifies with. Another tending of the fire. Thank you, John. I remember you saying, very early in the time I started attending PZI, that throwing a fit with someone could be a form of intimacy. That stayed with me, and I take solace in it when the rawness just seems to want a voice. It’s none of my business why, I guess. Ames! Scrumpette and I read this post together and we both love it! Ames! I love your living out loud. I’ve also been following the Charlie story like a bloodhound, which has given me some epiphanies about politics. We need to keep writing out our epiphanies and evolving ideas!! Thank you, dear Kent and Jennifer! J – I want to hear about your epiphanies and evolution! Amy, I really liked this blog. How is that we can rage about something one day, and the next day be more at ease with the topic? And I pictured a river, that on most days moves and flows with the terrain. Along comes a storm and the river rages over the terrain without paying attention to the detail of the land. A day later it is back to its normal path, although it is changed a bit from the storm. Do we change after a rage? I would like to think we do, that we find a better path for ourselves and learn to appreciate the simplicity of life. I appreciate you being able to put your thoughts and emotions into words.